Description: This book focuses on the additional liturgical and alternative readings of Targum Ezekiel, the so-called Targumic Toseftot. The critical text, translation, and commentary are presented with special reference to the long segments of unique mystical lore that are preserved in the Targumic Toseftot to Ezekiel 1, the chapter which describes the prophet�s vision of the celestial chariot. This unique manuscript material sheds light on a relatively dark chapter in the reception history of early Jewish mystical lore, being closely related to the Hekhalot literature, and to the Shi‛ur Qomah tradition in particular. 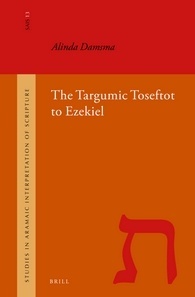 The volume concludes with a systematic treatment of the Targumic Toseftot to Ezekiel in relation to their Aramaic dialect, date and provenance, as well as their historical and social setting. Citation: Lena-Sofia Tiemeyer, review of Alinda Damsma, The Targumic Toseftot to Ezekiel, Review of Biblical Literature [http://www.bookreviews.org] (2014).